Obededom into the city of David with gladness. while some others make empty promises of employment for the youths. sustained during famine (1 Kings 17:8-9). make you the envy of all. Key Point: Those who live by the supernatural can never be at the mercy of the natural. 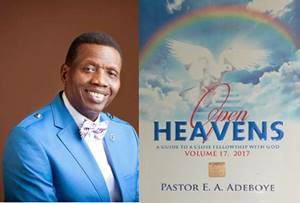 Open Heavens Daily Devotional guide was written by Pastor E.A. President of Christ the Redeemer’s Ministries. Why food prices are high in Nigeria – Osinbajo, Ondo Local Government chairman slumps, dies in hotel room and other major headlines you missed today!